Our lovingly, completely and modern furnished 3-room apartment with a total of approx. 70 m² has 2 separate bedrooms with large built-in wardrobes, double bed with single mattresses respectively Pull - out couch (160x200 cm) in the 2. SZ and is therefore suitable for families up to 4 persons. From the living room with adjoining open kitchen, with el. Oven, gas stove, fridge-freezer combination, you have 2 great grand doors with a wonderful view of the lake and the mountains on the east bank. In a friendly daylight bath with window and shower, shower cabin, bidet, WC you also find a washing machine for your own use. Bathroom and bedroom are accessed via a small separate hallway. In the living room you will find leather furniture (2 couch & 2 armchairs), glass couch table, a sideboard with many storage possibilities. New LCD TV with satellite receiver for more than 30 German-speaking and many, a. further & a. English language programs. In one of the two bedrooms there is another LCD TV with satellite receiver available. Another highlight of your holiday apartment is the unobstructed view from both the covered balcony - if it should rain - as well as from the sun terrace over the Lago di Garda. They look at the lake's eastern side, facing Malcesine, with the Monte Baldo mountain massif behind it. See the numerous surfers, kite surfers or sailors who find the most ideal wind conditions on the 'Lago'. On our covered balcony / portico with approx. 10 m² you will find wooden balcony furniture with comfortable cushions and a parasol, attached to the balconies to take your breakfast "well shaded" in the morning. On the directly adjacent sun terrace with approx. 35 m² you have 3 sun loungers for relaxing and sunbathing at your disposal. From the direct entrance area the terrace or the apartment entrance is separated by a lockable gate. Even your car is 'spoiled'. A lockable single garage is also part of your apartment. Shopping possibilities in the proximity: Shopping possibilities for you already in about 10 minutes, within walking distance of your apartment. In the original center of Pregasio you will find almost everything in the self-service'Plus-Market '. At the senior chef, delicious ham (crudo or cotto) and all the cheese specialties of the Tremosine region await your palate. And if you want to look directly at the producer, no problem. In a few minutes you can reach the Agriturismo 'Alpe del Garda' by car. Here you can taste typical products of Lake Garda and of course also buy. In the direct sale, not only freshly milked milk and natural yoghurt, besides the cheese and sausage products of the region, but also oil, honey, grappa, wine, noodles of all varieties and local craftsmanship are offered. And if you want to relax after your shopping, you can visit the restaurant vis a vis in direct sales once. Main town (municipality) Tremosine is Pieve, about 2.5 km away from the apartment. Here you should not miss to enjoy one of the incomparable views. Next to the Hotel Miralogo in the center of the small town we recommend the small bar on the right with the adjacent view terrace and / or the pizzeria at the village fountain. You can also find a cash machine here. In the Hotel Stella D`Oro opposite the small IP filling station you have the possibility to get to the Internet with your laptop. For a small charge, the hotel management will provide you with your access code and password. While you can surf the net via WLAN, we recommend you enjoy a cappuccino, latte macchiato or an aperole. Other drinks are also available! One also speaks German, so your 'excursion' into the world wide web nothing counteracts. Our local contact for 'all cases' can be reached directly at the SP 115 in Bassanega / Tremosine, not far from Limone. Featuring a large window bathroom has a shower next to which is completely surrounded by a fixed shower screen, also a Hängebidet, hanging toilet, a large bathroom - storage cupboard and a BOSCH washing machine. This can be used by our guests. A manual is provided in the apartment before this. At the open May-October outdoor pool is a community pool. Here are also a limited number of seating available in the summer. A covered outdoor shower is available to guests also in the area of ​​swimming pools. Use at your own risk! Also part of the kitchen equipment, a kettle, a small, typical Italian espresso maker with espresso cups. The kitchen equipment is very comprehensive! Wir haben als Familie (2 Erwachsene, 2 Kinder 8+12 Jahre) eine Woche im August in der tollen Ferienwohnung verbracht. Die Wohnung ist sehr umfangreich und mit vielen interessanten Infos zur Umgebung ausgestattet. Man fühlt sich sehr schnell heimisch. Dank der hohen Lage hat man einen absolut traumhaften Blick über den Gardasee, an dem man sich auch nach einer Woche nicht satt sehen kann. Das Früstück auf dem Balkon ist somit allein schon ein Erlebnis. Der Weg zur Wohnung bzw runter an den See ist teilweise etwas anstrengend, die Kinder waren allerdings jedesmal begeistert wenn es durch die Brasa Schlucht ging. Im Ort und auf der Anlage ist es sehr ruhig. Wer am Abend noch ein bisschen flanieren möchte, muss dann doch nochmal den Weg zum See auf sich nehmen, oder den Abend mit Blick auf den See und die vielen Lichter am gegenüberliegenden Ufer ausklingen lassen. Die Pizzeria am Ort ist zu Fuß gut zu erreichen und sehr empfehlenswert. Wir haben uns in der einen Woche sehr wohlgefühlt und können die Wohnung uneingeschränkt weiter empfehlen. Wir, mein Mann und ich, haben vom 12.-19.05.2018 eine wunderschöne, erholsame und entspannte Woche in Tremosine am Gardasee verbracht. Die Lage der Ferienwohnung ist, wenn man so wie wir zum ersten mal dorthin fährt zuerst einmal ein klein wenig gewöhnungsbedürftig. Vor allem das letzte Stück des Anreisewegs ist fahrtechnisch doch etwas anspruchsvoller und wird somit zu einem echten Erlebnis. Im Ort selbst und auch in der gesamten Anlage, war es bei unserem Aufenthalt wunderbar ruhig und somit auch sehr erholsam ( wenige Touristen). Die Ferienwohnung ist ordentlich ausgestattet, es findet sich genügend des täglichen Bedarfs...Geschirr, Gläser, Töpfe. Im Bad gibt es, falls Bedarf, sogar eine Waschmaschine und die Fewo war bei unserer Ankunft sauber. Die Terrasse und der Ausblick...es ist einfach grandios und mir persönlich hat es am Abend mit den vielen Lichtern vom gegenüber liegenden Ufer am besten gefallen. Sehr empfehlenswert ist die Pizzeria „S Marco“ im Ort Tremosine, super leckere Gerichte, freundliche Angestellte und wirklich faire Preise. Der Kontakt zu den Vermietern war während der ganzen Zeit einfach nur perfekt, unproblematisch, sehr freundlich und auch in den Urlaubsunterlagen wurde an alles bis ins kleinste gedacht. Das einzige Manko meinerseits, dass von uns dazu gebuchte Wäschepaket ( Bettwäsche und vier Handtücher )...am Anreisetag mussten die Betten noch selber bezogen werden und am Abreisetag wird darum gebeten, sie abzuziehen ( so kenne ich es aus anderen Ferienwohnungen nicht ). Die Handtücher...wie drücke ich mich nun gewählt aus...die Hand- und Duschtücher waren sauber, gar keine Frage aber weiße Handtücher sollten auch „weiß“ sein, da könnte gerne etwas in Neuanschaffungen investiert werden. Tolle Wohnung mit tollem Ausblick! Auch in der Nebensaison sehr zu empfehlen! Ruhe pur!! Above the west. Seeuferstrasse, betw. Limone and Campione is located, amidst the nature park "Alto Garda Bresciano di", the municipality Tremosine with their original places. Located in place Pregasio, near the main town Pieve, you will find our apartment in the charming "Alto Garda Residence". Here you will find in unspoilt countryside recreation and relaxation. A fantastic view, unobstructed, on the lake from the balcony or sun terrace will inspire you. But for a sporting holiday is Your vacation home is a perfect starting point. Suitable for cycling and mountain activities, hiking and climbing tours in the unmitt. Environment and also tennis and horse riding is possible. 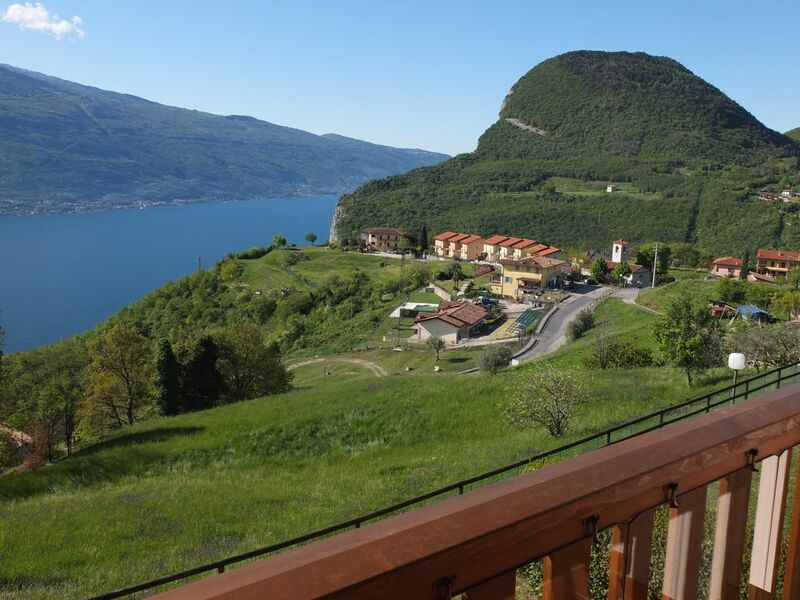 Alternatively, you can enjoy all kinds of vantage points overlooking the lake with his sometimes dizzying views or on the mountain massif of Monte Baldo. The lake is naturally a paradise for all water types. In about the 12th Min you are with the car on the lakeshore. Golf: More golf In addition to its golf resort in Toscolano Maderno opportunities in Cunettone di Salo the Golfclub il Colombaro or in the Golf Club Arzaga Carzago di Calvagese di Riviera. Endreinigung einmalig plus € 60,- Wir vermieten von Mai bis einschließlich September nur wochenweise. Anreisetag ist immer Samstag In Ausnahmefällen ist auch Ihre Anreise an einem anderen Wochentag möglich. Bitte zuvor mit uns Kontakt aufnehmen. Sie bringen Bettwäsche und Handtücher selbst mit. Wir nennen Ihnen rechtzeitig die Grösse der in der FW vorhandenen Kopfkissen und Oberbetten. Auf Wunsch stellen wir Ihnen auch gern Handtücher ( 6,-€ p.P.) und Bettwäsche (12,-€ p.P.) zur Verfügung.